We have gigabytes of pictures. Maybe a couple of terabytes. Not one of them can brace me for tonight. 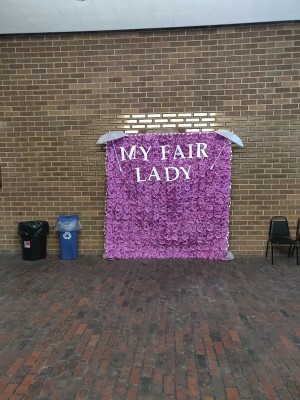 It will be our fifth viewing of Joliet Catholic Academy’s My Fair Lady, including one dress rehearsal, three night performances, and one matinee. My son plays Colonel Hugh Pickering. It is his twelfth role in high school, and his last. It is also his last with his sister, who is now a sophomore and has a few more productions ahead of her. My son will be going off to college in a little short of five months. He’ll either be eighty minutes away or four-hundred. Eighty is my new favorite number. When my father died in 2012, my son went through a very hard time. Like most boys his age, he thought sports would be his thing. He played on his grade school baseball team. He cried in fear once before a game. It wasn’t that he feared getting hit by the ball or not doing well at the plate or in the field. He missed his grandpa, and that affected him deeply. On the stage, though, he found his place. He played the chef in his school’s production of The Little Mermaid. You know the character: the one who joyfully sings, “First I cut of their heads, zen I pull out their bones” about the dinner he is about to cook. He stole the show with that performance. That set him on a new path, one that gave him confidence, poise, charm, and a way with words. It’s a craft and a passion he has shared all these years with his sister. When he and she starred in their high school’s radio show production of It’s a Wonderful Life, and when they starred as Scout and Jem in Lewis’s production of To Kill a Mockingbird, I think we reached our zenith as parents. Tonight is their last performance of My Fair Lady. I just came from their second-to-last-one. Tears welled up in my eyes, and I’m not a crier. There aren’t many tickets sold for tonight’s performance. All the better: fewer people to see me cry. I’ll miss him. I feel like I already do.